Just because it is a group interview, it does not mean you are not being observed. You are being observed from the very moment you enter the interview premises. Make sure you present yourself well because that is how you create your first impression. Wear proper formal outfit for the interview. Men may wear formal shirt and pants. Wear well pressed and ironed outfits. Polish your shoes before you head for the interview. Women may wear formal shirts and skirts or trousers. Women should avoid loud makeup while heading for formal job interviews. It is better to carry a deodorant and a mouth freshener along when you are heading for day long group interviews. Wear a watch as it gives an impression that you are time conscious. You must carry a handkerchief along with you when you head for group interviews. Your main aim in group interviews should be to stand out of the crowd. Don’t forget that everyone out there is trying for the same and hence it ain’t easy. You need to be well behaved and well mannered. Be confident while answering. It is the first best trick to impress. Your answers should draw the attention of interviewers but make sure they sound sensible and natural. The worst part of a group interview is that it could drain all your energy away. It could last several strenuous rounds where your emotional and mental capabilities are tested and evaluated. The group interviews may begin with large number of candidates but in the end only the selected few who deserve the job remain. You need to go prepared for many different rounds of interviews. The better your level of preparation, the greater your endurance to the several interview rounds. Here we have listed a few of the common rounds you may expect during group interviews. In such rounds, the interviewers try to evaluate two things. Firstly they try to evaluate the different approach each individual comes up with when they are posed with a problem. Secondly, they try to understand how you perform in a team activity. The problems they state are usually situational and based on the role which you plan to play in the organisation. If you are applying for the position of a store personnel, they may ask you how you would guide a client who is looking for a particular attire. You may be asked how your team will manage to complete a certain task within a certain deadline. Make sure you discuss with your teammates before answering such questions. It should appear to be a team effort. Group interviews seek team players and they won’t be really impressed by a one man show. Group discussions are an important part of group interviews. The interviewers ask questions to the group and evaluates or compares each one’s answer with the others. Very often, candidates are shortlisted through group discussions in group interviews. You need to have knowledge and a good sense of humour to clear through tough rounds of group discussions. The group interviewers may sometimes puzzle you with truly simple questions. You need to have the presence of mind to answer simple questions too in a very catchy manner so that it impresses. Many of the group interviews also have separate rounds of IQ and grammar tests. It is better that you prepare for these tests before you head for the interview. You need to prepare separately for clauses, vocabulary, infinitives, comprehension and essays if you are planning to appear for a grammar test. IQ tests may test your analytical and logical skills. You may practice Mensa puzzles, Sudoku and similar games that test your brain cells and rack them. If you go prepared, the whole round of IQ and grammar test would be a cakewalk for you. Individuals who lack confidence in their style try to ape others. If you want to create a lasting impression during group interviews, try to be yourself. Imitating others or quoting great people excessively won’t help you always. If you have a unique style and persona, that is what draws the attention of interviewers. Be honest while replying to questions. If you have certain weaknesses, accepting it in a modest fashion does not harm your image. Your image is actually harmed if there is a stark contrast between what you say and what you are. It is easy to voice your individual opinions during interviews but it is really tough to be a team player. You need to make sure you work as a team during group interviews. When a situation is presented in front of you, you need to discuss it with your teammates and take their opinions. You need to present your views too. After proper discussion, you need to arrive at a consensus that is mutually acceptable. Recruiters respect people who have properly thought and discussed their solutions before revealing it to interviewers. Only candidates who reveal a true team spirit are selected by the recruiters. In group interviews, you barely get to open your mouth and reveal your true self. There are some questions that give you this opportunity. When you come across questions targeted to individuals, you must make the best use of your chance. You may be given an opportunity to introduce yourself in 2 minutes. Speak of your core competencies, skills, abilities and talents. Tell them about the events you have organized or the special initiatives you have taken. Do not waste your time speaking of your friends, pets or pass-time. These things are not going to help you get your dream job. In group interviews, there could be rounds where you are told to give extempore speeches. Be prepared for something like this. If you have stage fear, you need to spend hours trying to get over it. Practicing in front of the mirror or in front of friends help a lot. You may prepare some common introduction to speeches. You may also research on the common topics that may interest the interviewers. Successful speeches are made by people who are well read and learned. You need to read the newspapers regularly and keep track of what is happening around the world. This will help you quote different real life information while giving speeches. You may also read some of the most impressive quotations and sayings to get a grasp on how to speak impressively. The interviewers are seeking the best candidates out of the lot. 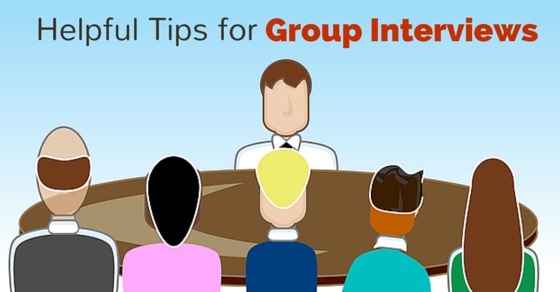 In group interviews, the interviewers have multiple options. If you do something wrong, you are out of the list of chosen candidates. You need to thus have a good control over your manners and body language. A well dressed candidate is always welcome. Make sure you go well dressed. As you enter the interview room, make it a point to greet the interviewers. Wish them with words like ‘good morning’ or ‘hello sir’. A crisp handshake is the easiest way to reveal a high level of confidence. When you converse with your interviewers, make it a point to make an eye to eye contact. Ask permission before you take your seat. This is a clear sign of good manners. Get introduced with other candidates in the room too. You must remember that in group interviews the interviewers observe how you behave with other candidates in the room. If you usually get tensed before interviews, you need to do something to de-stress. A cup of hot coffee or chocolates may help you feel cheerful. You may listen to music or do some yoga. These are other ways to feel happy and cheerful. Regular yoga and meditation helps the mind stay stress free and cheerful. Get rid of all the negativity before you head for the interview. You can be confident only when you are happy. The modern life is pretty hectic and stressful. Hence we need to take special efforts to rid our minds of stress and tension. Group interview is just another form of interview and if you are confident, no one can stop you from getting your dream job.